What does this mean for people who complete the online SAIL training? It provides assurance that the online class is easy to navigate, and that the course objectives are met by the activities that students complete throughout the class. 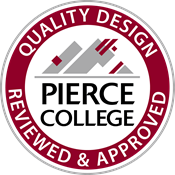 We are proud to be affiliated with Pierce College Fort Steilacoom which has been named as one of 10 finalists for the 2019 Aspen Prize for Community College Excellence, the nation’s signature recognition of high achievement and performance in America’s community colleges. Click here for more information about the SAIL online training through Pierce College.